Her rant almost seemed like a foreign language to me. It wasn’t that I was offended, but it had been so long since I’ve thought that way or really even been around people who aren’t aware of the tremendous power of their words, that I sat there dumbfounded. Now, I’m not this woman’s coach or counselor, but I wanted desperately to comfort her, to explain to her that every word that drops out of her mouth is sculpting her life experience. I wanted to warn her, to help her understand that whatever she believes and yes, utters out loud, will be seconded by the the great universal energy. I know. I’m probably like the annoying ex-smoker who no longer has patience for friends still practicing their former vice. So instead of lecturing her, instead of suggesting that if she wasn’t more vigilant, negativity, like a body snatcher, could eventually take her over, I held my tongue and thanked the blink, blink, blink pounding in my chest for showing me a better way. Okay, true confession. I didn’t see The Hangover Part III. Didn’t even see the second in the trilogy. But what this one-star summer bomb demonstrates is our tendency to repeat ourselves again and again, day after day. We get stuck in these loops, looking for the same things we saw yesterday. Today is a brand new day with an infinite number of new possibilities. Whoever took over for Ed McMahon could knock on your door with the winning check in the magazine sweepstakes. You could make a new friend or meet a potential S.O. You could get an idea for a book or a song or a nonprofit that might change the lives of millions. The thing is you never know. But because we get up every morning expecting the exact same thing, we get re-runs (Hangover Part III’s) of yesterday. Yea, there might be a little variety. You could get a speeding ticket, for example, or eat a pepperoni pizza instead of pasta, but admit it, you basically expect your world to look like a clone of yesterday. But what if you woke up to a world where everything was completely unrecognizable? Are you willing to allow that possibility? The possibility that the world’s largesse could flow into your life? The possibility that we could have peace on earth? And that every child could go to bed with a full stomach knowing they were deeply loved and cherished? If there’s one thing I know it’s this: We get out of life exactly what we look for…down to the precise shape, size and color. A major conundrum of quantum physics is that whatever the observer expects to see he sees. Physical reality, at its essence, is made of high-energy photons. And we, you and me, are patterns of light and information, patterns of light and information that we keep re-running and re-running. So, to my way of thinking, the more open we are to brand new, completely different possibilities, the better our world will become. So, yea, the first Hangover was kinda fun. But as for me, I’d rather see Bradley Cooper, Zach Galifianakis and all those other actors starring in a whole new film. When I first decided to start saying affirmations way back in January of 2012, one of the first I tried had to do with work. Work is my passion. I love what I do (I’m a freelance writer) and want nothing more than to keep sustaining myself (maybe, more than sustaining? Dare I say, thriving?) in this way. Since I had just given birth in November, though, and had only worked sporadically since then, I desperately needed things to pick up. So, I made some phone calls, wrote some emails and did all the usual things, without getting much response. Then I tried it: My affirmation. Here is what happened next: The following day (yes, DAY!) I received an email from a client that I hadn’t heard from in a while (my best paying client, no less). Then, later that same day, I landed an interview that resulted in a one-time paying job and a job offer (which I later refused due to other work opportunities). And the story gets even better. I got more work from my best client. I got several jobs from my from my agent. And I’m happy to tell you that the following months (until the birth of my second child) were the most productive and financially lucrative of my career. I am so surprised that things picked up so quickly and for so long–with just that one affirmation! Contributor: Freelance writer Mollie Player, who shares true, uplifting law of attraction stories every Friday at www.storiesandtruth.com. So today, I’ve got a packet of Reese’s Pieces and, like Elliott who was able to lure E.T. out of hiding, I’m hoping to lure out that curmudgeonly uncle to at least take a spin on the dance floor. Reese Piece No. 1: Dr. Lissa Rankin’s new book, Mind Over Medicine. After years of being a physician, Dr. Rankin finally got fed up with the seven minutes she was allowed to see patients and the refusal by her colleagues to acknowledge the most powerful component of a person’s health: their beliefs and their thoughts. Initially, she was as hard-nosed and closed-minded as any doctor, but after investigating 50 years of peer-reviewed medical literature (New England Journal of Medicine and Journal of the American Medical Association, to name a few), she found ample evidence proving that beliefs play a powerful role in a person’s biochemistry and to ignore those findings was irresponsible, a betrayal of the Hippocratic Oath. Reese’s Piece No. 2: The body is wired to heal itself. 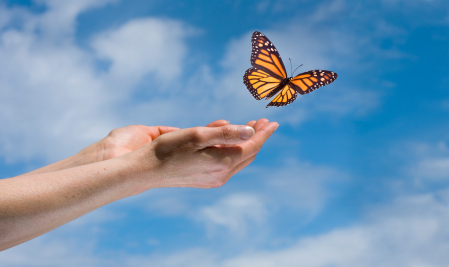 Our bodies are self-regulating, healing organisms, constantly striving for homeostasis. But instead of teaching our children this all-important fact, we teach them they need someone or something outside themselves to heal. The minute they get a fever or an ear ache, we rush them to that all-knowing doctor. This, at a very early age, cements in the fallacy that our bodies can’t heal themselves. Most of the thoughts in our default setting are planted before age 5. Reese’s Piece No. 3: Placebos are often as effective as drugs. Patients have been able to grow hair, drop blood pressure, lower cholesterol, watch ulcers disappear and cure about every other symptom after being treated with nothing but sugar pills. It was their belief they were getting “medicine” that cured them, not the medicine itself. Dr. Bruce Mosely, a surgeon and team physician for the Houston Rockets, performed arthroscopic knee surgery on two of ten middle-aged, former military guys. Three of the 10 had their knees rinsed (without the scraping) and the other five had no surgical procedure at all. It was an exercise in just pretend. After two years, all ten believed their surgery was a success. What Mosely discovered is that the bigger and more dramatic the patient perceives the intervention to be, the bigger the placebo effect. Reese’s Piece No. 4: Our beliefs are the hinge on which our bodies function. Rankin tells the story of a guy with tumors the size of oranges. After begging his doctor to try an experimental new drug he’d read about, he was treated with the drug and his tumors disappeared. Several weeks later, reports hit the airwaves that this new drug was not as powerful as originally thought. The tumors returned. His doctor, by now savvy, gave his patient a placebo, telling him it was a stronger form of the drug and that the ineffective trials had been using too little of this powerful drug. Once again, the tumors from his stage 4 lymphoma began to disappear. Finally, the FDA pronounced the drug ineffective and pulled it off the market. The patient, who had been rapidly recovering, died within a week. Okay, enough candy. I could go on and on about how 79 percent of medical students develop the symptoms they’re studying. Or about the woman with a split personality who has diabetes in one of her personalities and normal sugar levels in the other. But I’m not a doctor and would never dream of prescribing anything. We should teach our children that their bodies have self-healing superpowers. And we should quit hexing ourselves by looking for disease. And we should remember that if chimpanzees can lower their blood pressure at will, something Harvard doc, Herbert Benson, discovered in his research, there’s probably not much we CAN’T do to heal ourselves. Uncle, are you ready for that dance? No sooner did I appoint myself “Mayor of Crazy Town” (in yesterday’s blog), than blessings started rolling in. Hay House asked if I’d be interested in writing E-Cubed, a follow-up to E-Squared which totally cracks me up. Since changing the dominant paradigm is one of my major intentions (along with uplifting and inspiring everyone I meet), I feel extremely gratified. So, I want to offer a big shout-out to all of you, my community, my friends, my home boys and girls. 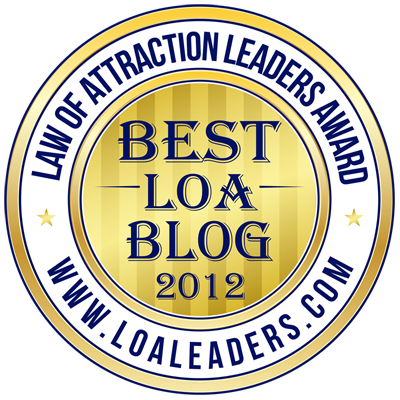 The LOA award is particularly meaningful because if this blog landed honors in 2012 in which I only BEGAN blogging (I think I started in November or December), just think what might happen in 2013. And also because accepting this awards feels like accepting the Emmy award that I intend to win next. And once you start feeling something and envisioning it, better step back, Jack! Which brings me to today’s topic: pre-paving. If you want to travel, buy a suitcase. If you want kids, buy diapers. If want to meet the lover of your dreams, buy a photo album for those inevitable wedding photos. You have to create a vision, walk in that direction and keep dancing—no matter what. Since I’m celebrating today (I celebrate most every day) and since my award apparently means, to quote Sally Fields, “You like me. You really like me.” I thought I’d offer this interview that ran on www.inspiremetoday.com. It’s a 20-minute feel-gooder with yours truly. Have the best weekend of your life!! Four of us went to dinner last night. We talked basketball, kids and my favorite topic: quantum physics, spirituality and the idea that consciousness creates the foundation of our lives. Two of us were avid believers. One of us shrugged her shoulders. And the other was vehement in his position that physical is the ultimate reality and that to even suggest our thoughts might have any affect on the world is sheer madness. Rather than argue, a tact that I’ve found to be about as effective as dieting, I simply listened lovingly and remembered the story of Guglielmo Marconi. He’s the Italian inventor who pioneered long distance radio transmission. In 1909, in fact, he won the Nobel Prize in Physics for sending vibratory radio waves 2000 miles across the Atlantic Ocean. But when he first suggested that frequencies of energy could be transmitted without wires, people thought he was nuts. When he wrote to the Italian Ministry of Posts and Telegraphs explaining the idea of wireless telegraphy, he was referred to an insane asylum. “Everyone knows that’s impossible,” he was told by detractors who scoffed at the crazy experiments he conducted in his parents’ attic. So, yes, believing our thoughts, dreams and beliefs are being transmitted out into the universe and shaping our destiny is probably not going to be popular with everyone. Some go so far as to call me delusional. I’d rather be appointed Mayor of Crazy Town than habitually focusing on what’s not working, on what can’t happen. I believe I can sit here in my Kansas home and, with my powerful, radio-transmitting thoughts, create joy, peace and insane happiness for everyone. Every day, I open my email to find the most amazing stories. I get pictures, tales of “coincidences” and incontrovertible evidence that the universe is just waiting for us to catch up, just waiting for us to begin using this energy that has always been available for our enjoyment and well-being. 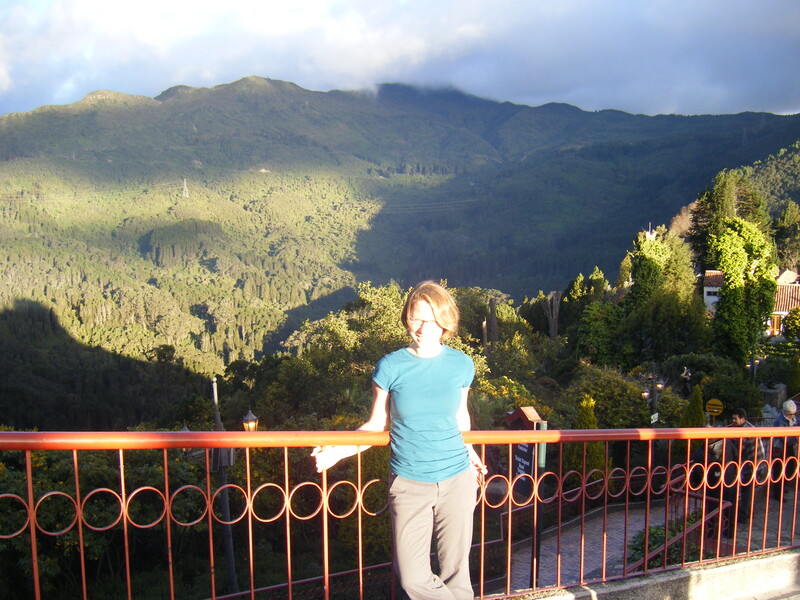 A few months ago, when writing a piece about medical tourism, I met this inspiring woman named Amy B. Scher who went to India to get stem cell treatment and wrote a book called This is How I Save My Life. It’s a great book, she and I became email buddies and to make a long story short, she ended up reading E-Squared. The other day, I got this email from her. “I’ve been doing the experiments from the book with my mom and wife. We were a little nervous on the yellow butterfly day as we were traveling alllll day on a very, very desolate part of the I-5, often loathed for being the most disgusting drive in California. There is nothing but dirt, tumbleweeds, fast food restaurants and the smell of cows. Not conducive for yellow butterfly sightings. About halfway through the trip, my wife and her tiny bladder were calling for a bathroom break. We pulled up to the only restaurant on this stretch of the road and she ran in. She came out with a small take-out box as she felt too bad using their restroom, but not buying something in return (even though we had literally just eaten). So, she bought a slice of peach pie. As she climbed in the car, she opened the box and I immediately screamed. 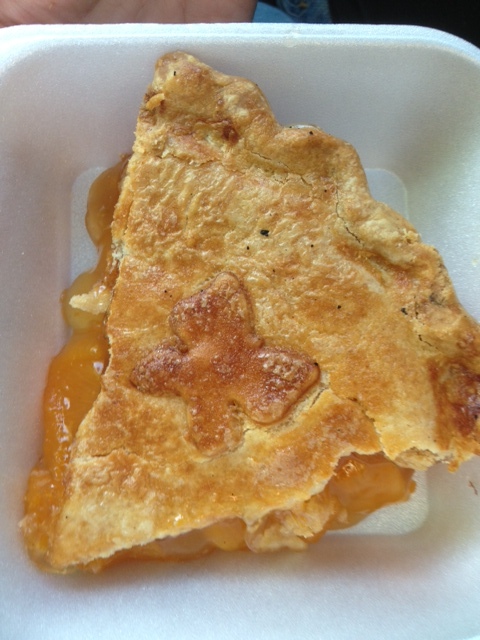 Unbeknownst to her, the peach pie she picked from behind the counter just to “buy something” had a little butterfly perfectly centered on top. And so it goes to show you…..even on the I-5, in the middle of no-butterfly land, the Universe can make it happen if only your intent is strong enough. Thanks, Amy, for sharing and thanks for your fabulous book. I’m a journalist, trained, degreed, the whole nine yards. In fact, I stated my illustrious journalism career at the Kansas City Star, the same newspaper where Ernest Hemingway and Walt Disney started their road to fame. The last few years, however, I’ve begun to alter my beliefs about “the facts” I’m sworn by my profession to seek. I’m not so sure that “just the facts, ma’am” is helpful anymore. In fact, these so-called “facts” create a negative energetic momentum that I no longer want to perpetuate. The “facts” I now choose to report are that happiness is our birthright, that love is the only reality and that the only reason the “facts” sometimes look otherwise is because that’s what we’ve spent so many years focusing upon. I now know that it’s unproductive to talk, report or give attention to anything I don’t want. And anytime I don’t feel joyful and at peace is because I’m giving attention to something that disagrees with Source. To use the old radio analogy, I’ve tuned into an “oldies station” that still believes in pain and suffering. I’m now committed to bringing a different energy to the party. An energy of love, an energy that sees only beauty, an energy that recognizes the Truth (and there is such a thing as truth with a capital “T” which is different than “facts”) in every person. I believe that’s what Jesus meant when he said, “Turn the other cheek.” He wasn’t suggesting that we should walk around with bruised cheeks and black eyes. He was saying that we should begin moving in a different direction, turn our cheeks, so to speak, to a higher, brighter, more pleasing reality. “Facts” are simply habits of thought we’ve been thinking so long that they now seem normal. When we invest in them over and over again, we validate them. We create more of them. “Facts” fill in around those beliefs. Quantum physics has proven it’s impossible to observe anything without affecting it. Sadly, we’ve been seeking (and therefore affecting) things that no longer serve us. We’ve been seeking “facts” that were perpetuated long before we evolved to the place where we realized we have the power to change them. And, yes, they’ve picked up quite a bit of momentum. But at any time, we can “turn the other cheek” and look in a different direction. As for me, I’m turning my cheek towards joy, towards peace of mind, towards the idea that all of us can be free and abundant and living lives of insatiable well-being. One of my favorite stories is about a four-year-old boy who kept pestering his parents for some “alone time” with his newborn baby sister. His parents, avid readers of parenting books, weren’t convinced that was such a good idea. “What if he pinches her?” they discussed between themselves, reflecting the current strategies for minimizing sibling rivalry. But little Johnny was not to be deterred. “We—her and me—have important business to discuss,” he insisted. Finally, while they waited within earshot outside the door, Johnny’s parents allowed him into the nursery by himself. We both agreed that the “something bigger” wasn’t anything we could capably put into words. But we feel it…in those quiet moments when our thoughts let go, when we plug into that connection with the unnameable reality that causes everything to exist. That definition, minus the baggage we humans heaped onto the Divine, certainly works for me. Thanks to flat-screen technology, our television sets are no longer shaped like boxes. But they still show us a “box of life” that is limited and constrictive. The only reason your life looks the same today as it did yesterday is because that’s what you’re looking for. The only reason the news seems so negative is because that’s where we invest our energy. Playing make-believe, as we did as children, is a much holier tact. In fact, what we see and believe as “reality” now is simply what we’re currently “making believe” is true. Once you loosen the rules and let go of all those “facts” you learned in school, all the patterns you picked up from your family and culture, you will begin to see a whole different reality. Right now, you’re stuck in habitual patterns of perception. You miss all kinds of miracles because you focus on what is “known.” You believe in the stringent “rules for life” that have been given you. Those arbitrary rules encase you in a little box that’s not much bigger than that flat-screen TV. My new intention is to notice what is different and new. To think about extraordinary things and to continually ask questions about what is possible. He suggests cultivating the habit of asking powerful, mind-altering questions. By asking open-ended questions, you train your right brain to respond to signals from your subconscious. To change anything in your life, change the frequency, density, and or quality of the light patterns that make up that reality. When you ask different questions, apply a different reference frame, you get different—and I would suggest better—information. It’s like a deck of cards. Pick a reality, any reality.